-exclusive control over the machines by an unauthorized person, the Triad representative. Who would have thought that our 230th Day of Independence would see American Democracy hanging by a thread? Yet so it is, and a good part of that thread is our movement to restore honest elections. Our task is immense and we are all rising to it. But as so much vital work is being undertaken in election integrity groups around the country—and as we find ourselves yet again deep in the swamp of skullduggery the American election cycle has become—the necessity for coordinating our ideas, strategies, tactics and resources is becoming more apparent than ever. At this critical juncture, when the need for working together can not be overestimated, we are happy to announce the formation of the Election Defense Alliance (EDA), a national coordinating body of election integrity activists, working throughout the country to defend our election systems against covert election fraud. EDA’s primary functions will be to provide coordination and focus; eliminate duplication of efforts; create a clearinghouse for the sharing of materials, know-how, and other resources; and facilitate cohesive decision-making about strategic priorities and tactical approaches. It is clear that election integrity forces will be successful only if our efforts have a cumulative and mutually reinforcing effect. At the same time it is also evident that strategies and tactics must be tailored to the needs of individual venues, and that local groups generally have the most experience in identifying and meeting such needs. Therefore EDA is structured to draw energy and ideas from the grassroots level and provide the synergy necessary to meld these disparate efforts into a cohesive national force to be reckoned with. Because November is bearing down on us, our initial emphasis is on the coordination of all efforts pertaining to election monitoring, data analysis, and rapid and effective response. Our goal is to permit affiliated groups to concentrate on their particular focus while Election Defense Alliance functions both to facilitate their efforts and to amplify the effect. To that end, we will share techniques for recruiting, training, and deploying the volunteer armies that will be needed in the field. We are also concentrating on establishing media connections, raising funds, and developing coalitions with non-election-related organizations to build the massive public awareness needed if election integrity is to be front-and-center in America. Each strategy component will have a working group of activists focused on that particular activity. Each group will select its own leader who will also serve as the group’s representative to EDA’s Coordinating Council, or leadership body. EDA’s affiliated organizations, whether or not they participate directly in one or several of these groups, will be able to draw upon the work and contributions of fellow affiliates and EDA’s collective expertise. In this way, EDA affiliates will be able to concentrate on their own specific missions (e.g., exit polling, HCPB, litigation, etc. ), while drawing upon the collective for many of the nuts-and-bolts components (such as education, PR, volunteer recruitment) that are necessary for successful election integrity initiatives. At the same time, individual initiatives will have dramatically greater impact when linked through EDA with the many similar programs being undertaken nationwide. To look at specific examples of just how EDA will function to facilitate the work and strengthen the hand of election integrity activists, please click here. In sum, affiliation with Election Defense Alliance will enable each member group to transcend its own resources without sacrificing its autonomy. The result of such synergy, we believe, will be the critical mass that we have all learned from experience is essential to our success. EDA differs from existing national groups in several important respects. First, it is not primarily a discussion list. We are action-oriented. Our primary objective is to create and implement a more comprehensive strategy than would be possible for any individual group or small number of groups working together. Yet, in recognizing the importance of coordinated strategies, we nonetheless also perceive that the vast majority of the work must be done at the state and local levels, not on the national level. Furthermore, we view attempts at national legislative reform as highly unlikely to succeed, and indeed fraught with HAVAesque perils, given the current constellation of power in Congress. At EDA we believe that success in responding to the electoral state-of-siege will require a vast expansion of public awareness and the channeling of that awareness into corrective action by citizens at every phase of the electoral process throughout the United States. And we believe that the public cannot be mobilized to the necessary scale and speed of action unless the prevailing reality, including the nexus between election-rigging and political dominance, is fully and frankly exposed. EDA will not shrink from publicly making those connections. Election Defense Alliance is both aggressive and strategic, prepared for the long haul but aware that there is no more wiggle room for delay, confusion, or ineffectiveness. Recent developments—such as the RFK Rolling Stone article, the Brennan Center Report, the California 50th District Special “Election,” and a dramatic uptick in media attention and public awareness—have set the stage for a very public battle over the future of our democracy. We know that the still out-manned forces of electoral integrity must bring their very best to this battle. The more individuals and groups affiliated, the stronger will be the impact that all of us will make together. The following activists have already endorsed and/or affiliated with EDA: Jerry Adams, Judy Alter, Ray Beckerman, Gary Beckwith, Tom Courbat, Marj Creech, Dorothy Fadiman, Brad Friedman, David Griscom, Sherry Healy, Kip Humphrey, Gail Jonas, Emily Levy, Victoria Lovegren, Sharona Merel, Lewis Miller, Mark Crispin Miller, Bruce O’Dell, Peter Phillips , Ginny Ross, Nancy Tobi, Bob Wilson. By joining with them and working with EDA you can continue the important work you are already doing AND be part of a critical collaborative effort, working together to make the enormous impact necessary for success. Our website at www.ElectionDefenseAlliance.org, though under construction, already features lots of helpful information, including our Prospectus, principles of governance and organizational structure, a growing resource library, biographical information of affiliated individuals and groups, discussion forums, and a blog. We believe the site will be very helpful in answering any questions you may have about EDA that we have not addressed in this brief introduction. We all know that our democracy is at stake and that time is short. This is the most important issue any of us has ever worked on. We must join together to be successful. Make this a momentous Independance Day for American Democracy. Please sign on at www.ElectionDefenseAlliance.org/join. (Research support was provided by the Investigative Fund of The Nation Institute. Anyone wondering where America's next electoral meltdown will take place--and it can only be a matter of time--might do well to turn back to the scene of the last one. Ohio was, of course, ground zero of the 2004 presidential election, and now it's the battleground of one of the most hotly contested governor's races in the country. The Republican candidate this November is none other than Kenneth Blackwell, Ohio's Secretary of State, a man vilified by voting rights activists for a string of baffling and, to all appearances, nakedly partisan rulings in the 2004 presidential race, when he also doubled as co-chair of George Bush's state re-election campaign. Now he's at it again--issuing draconian guidelines on voter registration that carry the threat of felony prosecutions against grassroots get-out-the-vote groups, especially in Democratic-leaning urban areas, for even the slightest procedural irregularity. Despite denials from Blackwell's office of any malicious political intent, the guidelines have had an immediate chilling effect on groups like the activist community organization ACORN, which has suspended registration efforts pending urgent consultations with its lawyers. Several leading Democrats have urged Blackwell to step aside from all election-supervising responsibilities, a proposal his staff has greeted with near-derision. It would be bad enough if Blackwell were acting merely to benefit his party, as he did in 2004. But in this case he's taking advantage of his office to act on behalf of his own ambitions. Unless something changes between now and November, he will remain in charge of counting the votes--his own and everyone else's. In a pivotal election in a pivotal state, this is far from reassuring. As Peg Rosenfield, an elections specialist with the League of Women Voters of Ohio who spent twelve years working in the secretary of state's office in the pre-Blackwell era, put it, "If you think '04 was a mess, just wait. I anticipate a debacle." During a White House press briefing on June 8th, a tough question caught Tony Snow off guard. "Robert F. Kennedy Jr. has written an article in Rolling Stone which revisits the Ohio vote in 2004," a Baltimore radio reporter asked Bush's spokesman. "Does the president believe Kennedy has raised any new evidence of voter fraud?" Snow tried to deflect the question with a joke, suggesting that the reporter should serve as Bush's "emissary from Rolling Stone." 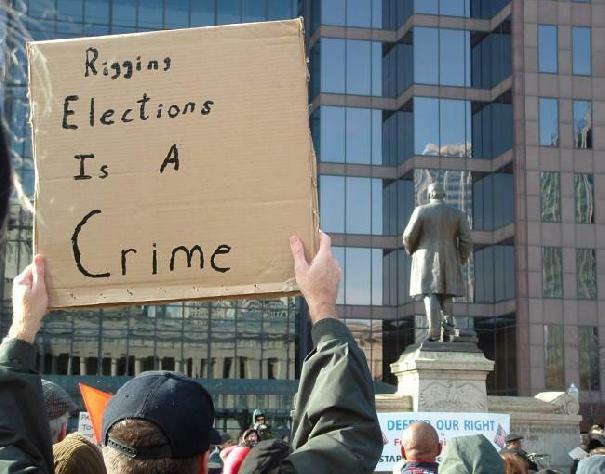 But many citizens, journalists and elected officials are taking our four-month investigation of vote-rigging in Ohio far more seriously ["Was the 2004 Election Stolen?" RS 1002]. The debate began online, where the story set off a firestorm. More than 700,000 people logged on to rollingstone.com to read the story, and thousands of bloggers posted heated entries about Kennedy's report. The online furor caught the attention of some in the mainstream press, which has long downplayed the evidence of vote tampering. In The New York Times, Bob Herbert devoted an entire column to our investigation, concluding that John Kerry "almost certainly would have won Ohio" if Republicans had not blocked so many of his supporters from casting ballots. And The Seattle Post-Intelligencer blasted the media for its "deafening" silence on Kennedy's report. "In terms of bad news judgment," the paper observed, "this could turn out to be the 2006 equivalent of the infamous Downing Street memo" -- evidence that the Bush administration falsified intelligence on WMDs to justify invading Iraq -- "that was initially greeted by the U.S. media with a collective yawn."